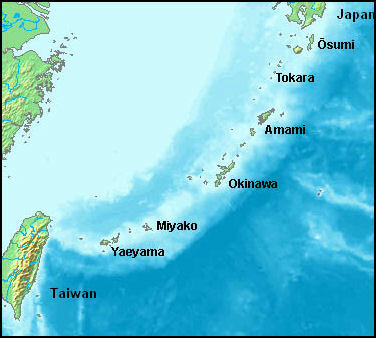 RYUKYU ISLANDS (south of Kyushu) extend for around 1,000 kilometers from 40 kilometers south of Kyushu to 100 kilometers east of Taiwan. Some of the 200 or so islands are volcanic. Most are made from coral. The islands in northern half of the island chain are part of Kagoshima Prefecture. The four island groups in the southern half are part of Okinawa prefecture. The climate is considerable warmer than the main islands. The area is often struck by typhoons in the summer. During the winter months the temperatures are cool but the water visibility is at its best. The towns and villages feature old buildings made of wood and tiles and new buildings made of stucco, glass and poured concrete. The soil is generally thin and poor and is used to grow sugar cane and rice. Along the coasts are beaches, rocks and mangroves. Inland are patches of jungle. The main attractions of this area are beaches, diving and watersports. Most people get to the islands by ferry. Not many of the islands have airports..
Yakushima (2½ to 5 five hours by boat from Kagoshima) is an island that measures about 17 miles across and is 75 percent mountains, with 40 peaks over 1,000 meters high. The highest mountain, Miyanoradake peak, is 1,935 meters tall and topped by snow in the winter. Otherwise this island is largely tropical or subtropical. The only real road is one that circles the perimeter of the island. Designated by UNESCO as World Natural Heritage Site, Yakushima Island is one of the wettest places on earth, with annual rainfall reaching 10 meters (394 inches). Describing the weather, one of the island's 14,000 residents told Reuter, "It rained literally non-stop for two months and that was after the rainy season ended. The rain is caused by mountains that trap clouds and force them to release their moisture. The interior is almost always shrouded in mist and rain clouds. The rain provides water for lots of waterfalls. All the electricity needs on the island are supplied by hydro power. The residents of Yakushima had once hopped to sell their abundant water supplies to the Middle East but those plans were scuttled with the development of giant desalinization plants. Yakushima now hopes to make money through fish farming and tourism, attracting visitors with red-faced monkeys, sea turtles, 3,000-year-old shamanist traditions, abundant waterfalls, tidal pools, hot springs, banyan trees, and hikes through dripping rain forests with giant 1,000-year-old moss-covered cedars. 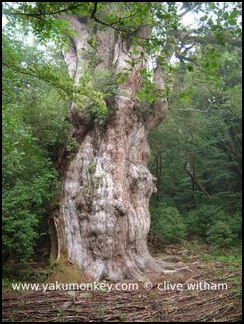 One particularly famous cedar, the Jomon cedar, has a 28-meter circumference and may be 7,200 year old, making it possibly the oldest living thing on the planet. Great efforts have been made to preserve the old tree. In the summer a guard is posted around it. 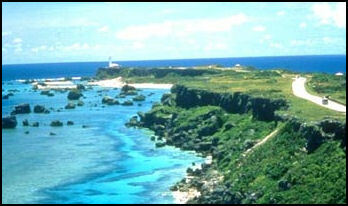 About one quarter of the island is protected by the as part of Kirishima-Yaku National Park. Even though much of the island is inaccessible by road, there is a large network of hiking trails. One of the most popular routes is three-day trek through the middle of the island. Popular destinations include the Jomon cedar, 88-meter-high Oko waterfall and 60-meter-high Senbiro waterfall, which tumbles down a massive granite cliff, and Shiranti Unsuikyo, a gorge with many waterfalls and mossy forests. Miyanoura is the main town on Yakushima. It has a tourist center with maps and hiking routes in English and a number of restaurants and guesthouses. Jomon tree Maeham and Inakahama (northwest side of Yakushima, north of Nagata) is one of the world's most important nesting sites for loggerhead turtles. The nesting season is from mid-May through the end of July. The sites are often fill with tourists who surround the turtles with flashlight and cameras and can’t suppress their desire to touch the turtles shell and flippers. Sea Turtles on Yakushima: Yakushima and Tanegashima islands are the two main turtle egg-laying areas in Japan. Yakushima is the largest nesting site for loggerhead turtle so the North Pacific and the northernmost landfall in Japan for green turtles. About 4,000 loggerheads came ashore in 2005. 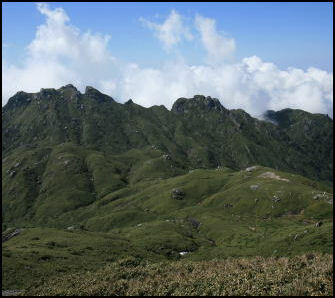 The primarily egg-laying areas around the town of Kami-Yaku on Yakushima. The loggerhead nest primarily on three beaches---Maehama, Inakahaa and Yotsusehama, which are collectively known as Nagatahama on the northwest part of the island . Some 5,051 turtles came ashore here in 2004. The second main area is around Nakatane on Tanegashima island. A total of 338 turtles came ashore here. The egg-laying season for the sea turtles from late April to July with hatchlings making their way to the sea from July to September. About 100 people show up every night to observe the females come ashore and lay their eggs. Sometimes they create a disturbance with car lights and noise. There have been cases of turtles coming ashore and not laying any eggs and baby turtles not being able to emerge from their holes because the sand had been disturbed. The Yakushima Umigame Kan is non-profit organization run by volunteers that is dedicated to helping the turtles. Amami-shoto Island (north of Okinawa) is a group of five main islands that spread about 180 kilometers from north to south and are used primarily to raise bananas, papayas, pineapple and sugar cane. Forty-kilometer-long Amami-Oshima Island is the largest island in the group. It is known for its beaches, tropical vegetation, the Kinsakunbaru Virgin Forest, Tanaka Isson Memorial Museum of Art. The other islands are Kika-shima, Tokuno-shima, Okino-Erabu-jima and Yoron-jima. The two main Yaeyama islands are Ishigaki-jim and Iriomote-jima. Ishigakjima Island has a dive site about one kilometer from the west coast of the island where manta rays are regularly seen from July to September. By one count around 230 manta rays live around the Yaeyama Islands. Iriomote Wildcat Iriomote (115 mile east of Taiwan) is a hilly 113-square-mile island with 130 kilometers of coastline. 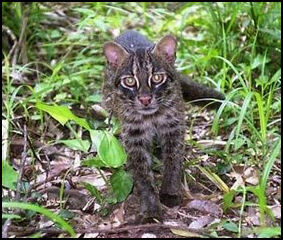 The home or rarely seen and highly endangered Iriomote cat, it is covered by Japan's only true tropical forests and the northernmost mangrove forests in Asia. Only 2,200 or so people live on the island. There is one main road, two stop light and no high school. A sprawling national park preserves much of the interior. There are boat trips and treks in the jungle to waterfalls. The diving is good and manta rays are often seem at Hatoma-jima Island off Iriomote-jima. Yonaguni Monument (off tiny Yonagunjima Island in the southernmost part of Okinawa prefecture) is a mysterious sandstone structure that rises from a depth of 25 meters to the surface in water of the shore . Measuring 250 meters long and 100 meter side, the structure is cut into a series of flat, level terraces, connected by steps. The stricture was discovered in 1986 by a local scuba diver. Some have called it an underwater Machu Picchu. Scuba trips to it are available. Marine geologist Masaki Kimura of Ryukyu University believes the monument is an ancient ceremonial center built on land by an ancient civilization that lived the end of last glacial period about 10,000 year ago and covered by seawater when the glaciers melted and sea levels rose. Other disagree and say the structure has been made by natural forces. Some of the monuments’ feature---two large monoliths standing side by side, round holes that look like they once held pillars and an orientation towards the stars---seems consistent with something man made. Some say some marks found on the sea floor belong to an ancient pictorial language.